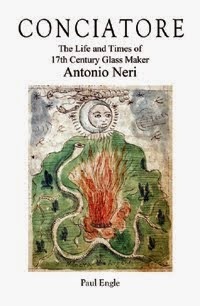 Antonio Neri is best remembered for his seminal 1612 book, L'Arte Vetraria, in which he presents an extensive set of recipes for making and coloring glass. Less known are his writings on the subjects of alchemy, chemistry, natural philosophy and herbal medicine. In addition to the glass book, there are five other known works by Neri, and an additional six which have not been found. This makes, in total, twelve distinct works attributed to the priest. Of the writings we can lay our hands on, one is an illustrated manuscript for a book on alchemy that was never published; he called it Treasure of the World. Another includes medicines and other preparations. Two works are devoted to chemistry and the final item is a copy of a letter sent by Neri in Antwerp to a friend in Florence, the subject of which is also medicine. L’Arte Vetraria (Florence: Giunti, 1612). Il tesoro del mondo (Treasure Of The World, 1598–1600). Book designated A, B, C, D, E, F (c. 1613). Discorso sopra la chimica (Discorse on Chemistry, 1613). Ragionamento dell’arte chimica (Rational Of The Art Of Chemistry, 1613). Letter to a friend (1608). Among the found items, there is still much work to be done; Treasure Of The World is spectacularly adorned with sixty-one ink and watercolor illustrations. The manuscript contains 175 recipes yet to be deciphered. Among them are various preparations, including the production of artificial ruby, as well as apparatus for producing the fabled philosopher's stone. The book designated A, B, C…exists as a full manuscript in Glasgow, although in poor condition, and in Florence as "extracts"; these two versions have yet to be compared to each other and to the thousands of pages recorded by Neri’s assistant, Agnolo della Casa. The Glasgow version contains an insert titled "Techniques Copied from an Old Book Here in Pisa." The same page is dated 26 January, 1613. Discorso was published recently by Maria Grazzini (Nuncius, 2012) with correct attribution, after it was plagiarized in 1670 by Jesuit Francesco Lana Terzi. In the letter to a friend, Neri tells of "curing sickness," in accordance with Paracelsan doctrine, "to the great astonishment of Antwerp." 7. Neri’s letters to Emanuel Ximenes (1601–1611?). 8. Herbarium Antonii Nerii Pavodetensis (Herbal Tranquilizers ?). 9. Opuscula duo, unum de chimiis et naediis alter P. Antonii Nerii. 10. Recettario chimico (Book Of Chemical Recipes). 11. Medicamenti di Prete Antonio Neri (Medicaments). 12. Materia di tutto il composto di Prete Antonio Neri. 2014 marks the four-hundredth anniversary of Antonio Neri's death. There is still so much yet to learn about this fascinating character living on the cusp of early modern science. For more on the works of Antonio Neri see Pieter Boer and Paul Engle, “Antonio Neri: An Annotated Bibliography of Primary References”, Journal of Glass Studies, v. 52 (2010), pp. 51-67.